"In the old days pictures went forward towards completion by stages. Everyday brought something new. A picture used to be a sum of additions. In my case a picture is a sum of destructions. I do a picture-- then I destroy it. In the end, though, nothing is lost: the red I took away one place turns up somewhere else. In one of his very few published interviews, Picasso calls his pictures "a sum of destructions". Even from decades beyond the grave, this prolific painter-sculptor-printmaker telegraphs to us the startling, singular image of artist-as-destroyer. Every cheerful demolitionist, loving his job, knows that in order to create you must first create space. It's only logical. You must remove what was there before-- you must destroy it-- you must destroy the blankness of the white canvas or the white page as the demolitionist destroys the old building or carpark, consume it with colors and lines and forms as the cheerful demolitionist consumes his with dynamite, nitro, and implosion-physics. You must swallow the thing with work in order to build something new in its place. Picasso's destructions led to Cubism. One must destroy in order to create. This is a poetic notion and perhaps not properly a philosophy, however the idea suggests to me what I take to be an elemental truth of our world-- Life exists by eating other life. This sad observation is my credo. Life itself is an ignited consumption, a violence, a continuing energy exchange, sometimes conscious, sometimes unconscious, beginning with birth and ending in death, consumption, and destruction. Man is born unto trouble as the sparks fly upward. This is the secret meaning behind the term "Comics Destroyer". For a working cartoonist to call himself a "destroyer" of comics, when what he primarily does is create comics, it must be understood as a form of the Greek double negative. It is to say, "I do not not create". It is a kind of linguistic pranksterism-- a verbal-visual joke, even more so because the metaphor is continued through the symbol of the cartoonist as a soulless, mechanical machine-man-- the "Popemek". This image itself is intended as an ironic one-- since a machine cannot create anything, it can only perform a task it was designed to accomplish. 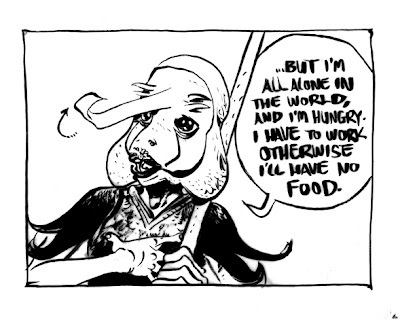 When I first started thiking along these lines, I was doing nothing but eating, sleeping, and making comics. I felt like a machine of comics. I wondered if perhaps the artist, like the machine, is only capable of doing what it was created to do. A cartoonist makes comics. 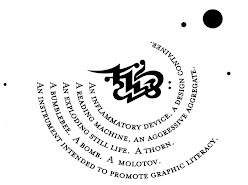 The "Comics Destroyer" became a kind of personal symbol, a self-assigned mandala, magic, a new-name. It was secret initiate's knowledge, and it helped push a tired brush through many long nights. "In order to save comics, I had to destroy it." This Destroyer statement is agitprop, of course, and like all agitprop, it is intended to confuse and alarm the uninitiated and reward those in-the-know. It is a way of saying both "I embrace change", and "Comics must change if they're to survive." As indeed I do, and indeed they must-- continually and evermore. I take it as a moral imperative to question all traditions and presumed rules of the comics medium. As an artist, I will cleave to the traditions which point to real, true, and vital rules of art. I will borrow traditions and rules of other art media if they can be applied successfully to comics. I will discard (i.e. "destroy") all local, static, inflated, and worn-out edicts which serve only to keep the medium of comics in stasis-- rules which may've worked at one time and in one place, but no longer do. This intolerance of the shop-worn and trite applies even to my own standards and rules, as it did when returning from Japan, having learned so many new traditions and techniques from manga, so many new ideas which challenged or broke even the most basic presumptions of American and European comics, I realized the only comics I was destroying was my own. As it continues today, working from America for a ever-widening international audience, moving into various multi-media areas of creative collaboration, looking back through what has come before with this American-Euro-manga lense. Looking up and out toward what is possible. What old plot is that over there, just waiting to be smashed so that we may build up something new? What is that fresh horizon? In the end is this affirmation: The art form of comics itself, like all others, is elastic, open-ended and expansive. The comics medium has the power to contain and express all human thought, feeling and experience, from the most sacred to the most profane, and back again. There is absolutely nothing you cannot express through the medium of comics. As long as there are artists-of-comics who wish to create, and ideas they wish to express, this one true and unchanging rule remains indestructable. THERE STILL IS ONLY KING KONG!